Death may not be a pleasant topic, but it is as inevitable as taxes and some advance planning should be done to deal with the aftermath of a death of a foreigner in Thailand. 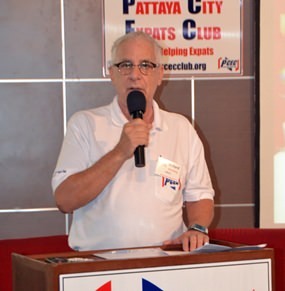 There were three speakers at the Sunday, March 8, meeting of the Pattaya City Expats Club (PCEC) who provided information on “preparing for the inevitable.” These were: Kelvin Bamfield, CEO of Thai888 Law Company (Pattaya), Julian Blewett, Vice-Consul for the British Embassy in Bangkok, and Geoffrey Robertson, Branch Officer with Allison Monkhouse Funeral Directors (Bangkok). Kelvin Bamfield has lived in Thailand for over 15 years. For the first half of that period, Kelvin was retired. Then he decided to rejoin the workforce as CEO for the Thai888 Law Company. Kelvin Bamfield said that he attended the PCEC meeting and heard the presentation of representatives of Allison Monkhouse Funeral Directors explaining the services they perform here in Thailand for the deceased including the arrangement for prepaid funeral services. Kelvin felt there was a natural synergy between law firms and funeral services companies when dealing with the death of a foreign national in Thailand. Consequently, his law company has arranged to represent Allison Monkhouse Funeral Directors for the Chonburi-Pattaya area offering living will, executors, funeral services, probate, repatriation of remains, and disbursement of assets. 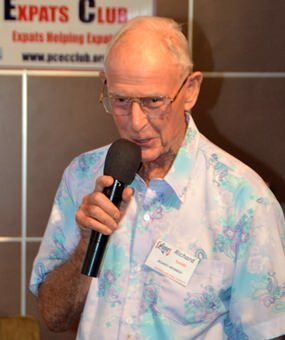 Death is not something we want to contemplate, but MC Richard Silverberg in introducing the PCEC speakers points out that their topic about preparing for the inevitable is something we should all know about. Everyone should have a will, Kelvin said. A will indicates who the beneficiaries are, lists what the person’s assets are, and names an executor. He mentioned that in Pattaya it takes three months for the Thai court to schedule a hearing on the will and all that really happens is that the will is officially recorded and the court confirms that the executor named in the will can proceed to execute the will; an additional month is allowed for challenges to the named executor before the executor can begin settling the estate. This means that the assets of the deceased are frozen for four months. The only money that can be taken from the deceased’s bank accounts during that period is funds necessary to pay for the funeral. So, if a foreigner dies in Thailand and leaves behind a Thai (or other) partner who is the beneficiary of the will, the partner does not have any access to the assets of the deceased during this four-month period. One way to ensure that the partner will be able to access some funds is for the foreigner to set up a joint account with the partner and deposit some money in that account. A joint account is not frozen when the foreigner passes away; the partner still has access. Once approved, the executor has lots of work to do – e.g. closing down bank accounts, selling properties – though his or her job is much easier if the will covers just assets in Thailand. Kelvin said that it is a good idea for foreigners to have one will covering their Thai assets and a separate will covering their assets in their home country. In this situation, it is important that the Thai will state clearly that it covers only assets in Thailand. To prepare for the inevitable, Kelvin Bamfield with Thai888 Law explains the importance of having a last will and testament so that your wishes will be carried out after your death. If a foreigner dies in Thailand and has an executor who is back in his or her home country, the executor has to come to Thailand and will likely have no idea how to proceed. Also, all documents prepared for a Thai court have to be in Thai. Consequently, it places a burden on the executor and in some cases, they may be unwilling or unable to carry out their duties under the will. It is even worse, Kelvin said, if someone dies intestate – i.e. without a will. When this happens, the next of kin has to be found. Embassies may be able to help with this if the deceased had registered with the embassy. Julian Blewett, who joined the British Embassy in Bangkok as Vice-Consul in July 2012, said that most passports have a page at the back where you can enter information on whom to contact in case of emergencies. Further, the British Embassy in Bangkok has prepared an information guide on what has to happen upon the death of a British national in Thailand (see www.gov.uk/world/thailand). Julian provided some information on the consular services provided by the British Embassy. Some of the work of the consular section is proactive, such as providing advice on what you need to know before you arrive in Thailand; and liaising with Thai authorities about issues affecting British nationals. But most of the work is responsive. It includes, for example, providing notarial and documentary services, emergency travel documents, and assistance to British nationals in difficulty. Julian said that the embassy handles an average of 6.5 new cases every day. PCEC Vice Chairman Richard Smith advises the PCEC membership that the English Conversation classes for Thais that operates under the auspices of the Banglamung district chief and Chonburi governor will be starting soon and is in need of volunteers to participate. Geoffrey Robertson, who has been in the funeral industry for the past 14 years, explained that Allison Monkhouse Funeral Services provides a service that allows people to pre-pay their funeral expenses thus relieving their loved ones of having to make these arrangements during a time of grief. The funds are held in escrow until they are needed for the funeral. Geoffrey indicated that if someone has prepaid their funeral with Alison Monkhouse and dies outside of Thailand, Allison Monkhouse will transfer the funds to a funeral parlour in the other country where arrangements are being made. Geoffrey said that a simple cremation in his funeral services company costs about 35,000 baht. 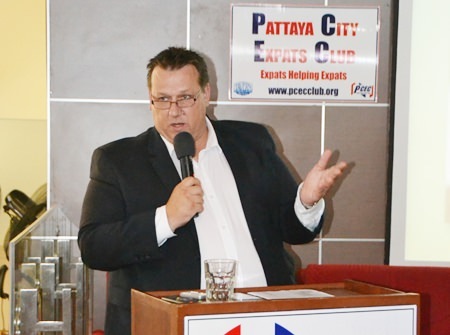 During the question and answer portion of the presentation, Kelvin noted that 888 Law Co. has been providing last wills and testaments for Pattaya City Expat Club members at half price, which is 5,000 baht, and that also will prepare a living will for 5,000 baht for PCEC members. 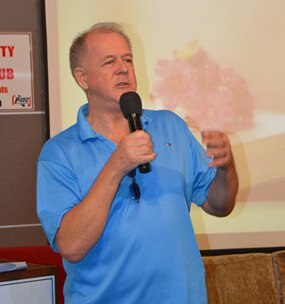 After the presentation, MC Richard Silverberg brought everyone up to date on upcoming events and called on Roy Albiston to conduct the Open Forum, where questions are asked and answered about Expat living in Thailand, especially Pattaya. 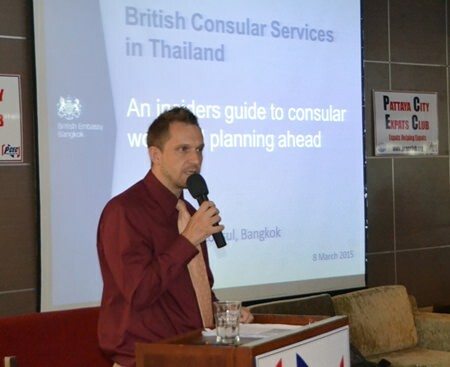 Vice Consul Julian Blewett describes the consular services that are provided by the British Embassy in Bangkok, including when a British citizen dies in Thailand. Geoffrey Robertson with Allison Monkhouse Funeral Directors points out one of the advantages of setting up a pre-paid funeral is that your grieving loved ones do not have to burden themselves with making funeral arrangements.